The Summerland Tour, previously hailed by Rolling Stone magazine as one of the “10 Hottest Summer Package Tours,” returned this year with Allen & Heath iLive digital mixing systems managing FOH and Monitor positions. 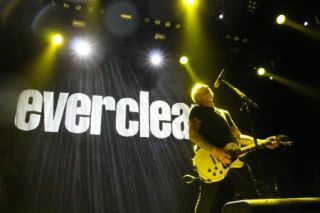 Art Alexakis, lead singer and guitarist for Everclear, preforming liveNow in its fourth year, the annual Summerland tour is devised by Art Alexakis, front man of the popular 90s alternative rock band, Everclear. This year’s tour comprises Everclear, Toadies, Fuel, and American Hi-Fi, traveling across North America to over 30 different venues. Alexakis gives credit to the iLive systems – comprising of two iLive-T112 Control Surfaces and iDR-32 MixRacks - for playing a huge role in the success. Derek Steinman, Production Manager/FOH of Everclear/Summerland Tour, (left) and John Riley, Monitor Engineer and Stage Manager for Summerland Tour (Right)“We carry two Allen & Heath iLive T-112 surfaces and two iDR-32 mix racks for FOH and monitors. The board sells itself, and I can just hit the ground running. This console allows me to be connected to the band and get a focused mix at the same time,” said Steinman.